“Armenian composer and pianist, Alexandre Aroutiounian (1920-2012) was awarded many prizes for his compositions throughout his career. His Aria and Scherzo for Trumpet and Piano is little-known, yet it is a sublime addition to the modern repertoire. Aroutiounian's works have been performed all over the world and he is particularly remembered for his Trumpet Concerto. Melodic and rhythmic characteristics of Armenian music are prominent in Aroutiounian's works, further expressing his nationality by use of ashughner (folk minstrel) improvisations. 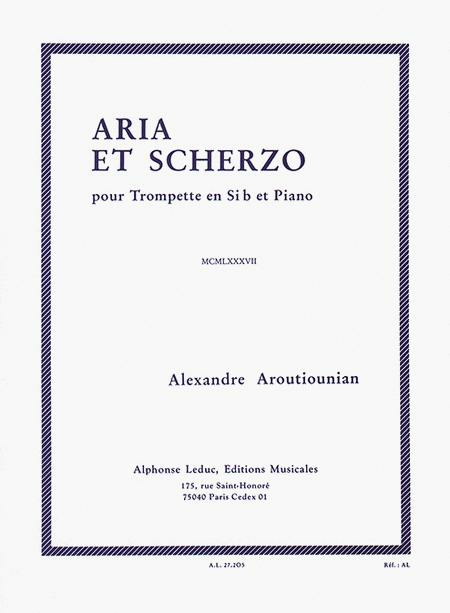 Aria and Scherzo is made up of two movements, the Aria marked as adagio and the Scherzo as allegretto. Tonality is exploited throughout and contains unique uses of rhythm and ensemble. 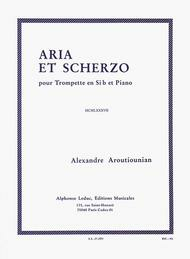 Aroutiounian's Aria and Scherzo is an exciting piece for all advanced trumpeters.”.